Designer Long Sleeve Shirt Geometric by Kevingston. Add some contrast to your dress shirt collection with the designer long sleeve shirt. Designed in a tailored dress shirt fit with white V-design along shirtfront and shoulders. Constructed with button-up front with placket that conceals button closure. 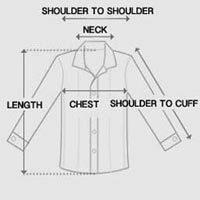 Designer long sleeve shirt made from soft and breathable cotton fabric. Features semi spread collar with sturdy frame ideal for bow ties. Double-buttoned wrist cuffs to easily adjust cuff fit. Give any ensemble a contemporary look with the designer long sleeve shirt.